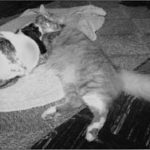 Twenty years ago, the House Rabbit Journal published a photo essay, “The Gift of Their Presence” by Amy Espie (then Shapiro). It included three of Amy’s photographs and a poem. Her poem described the ways that rabbits enter HRS households (“They come as transients,/ rescued from the streets or the shelters”) and make these environments into homes for themselves and us. Surely Amy’s photographs have always been about that: how rabbits, humans, and their friends create a life together. Negative capability informs so many of Amy’s photographs. All of them invite the viewer to come into the other’s point of view. I detect this so strongly, for example, in the cover photograph of a rabbit looking out of a cardboard carrier used to transport animals from the shelter to their adoptive homes (HRJ, Winter 1994, 1). The side of the cardboard carton reads “Peninsula Humane Society,” and from the box a rabbit looks out with a flatness of expression that suggests low expectations, to say the least. The rabbit’s look sears us, even though we know that he has just been rescued. What the photograph seems to convey is that at that moment, the rabbit feels an exhaustion of spirit at entering, yet again, another alien place. Happily, many of Amy’s photographs depict rabbits adapting beautifully to their new rabbit-friendly households, teaching us to provide for rabbits’ basic species needs by employing the “craft of paying attention” (HRJ, Winter 2003, 4). 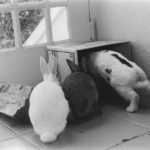 These are Amy’s educational photographs: rabbits in litter boxes, tunnels, and hidey-holes; rabbits reconstructing human objects; rabbits lounging with non-human friends in parallel worlds created within ours. and seek it in return. For most of us, Amy’s photographs document most especially rabbits’ profound desire for relationships and their modes of reciprocation. They make us see not just rabbits sitting side by side but rabbits leaning into each other at more and more dramatic angles to challenge the physical limits of intimacy (HRJ, Summer 2002, 5). They show us a rabbit assiduously improving every micro-inch of the family cat’s fur (right) with apparently tireless concentration and dedication. as they play and exercise. Amy’s comic art bounces human and rabbit points of view off of each other. 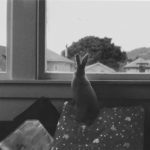 The entertainment factor of her photographs is often rabbits’ perspective on familiar human objects. We see a pair of human shoes received as chewable shoelaces. We see a television set morph into a springboard to a bookcase. Although we think of the narrow corner between wall and open door as only dead space, when we see Amy’s photograph, it becomes the perfect v-shape container for a secure rabbit body. Amy’s funny photographs, as her serious ones, make us see rabbits and ourselves from disorienting angles. We look at a rabbit who has been abruptly interrupted from her work, and we feel the jerk of traveling instantly from mental to external worlds. following their own private path. Of all of Amy’s pictures, the ones I love most are those that leave the most unsaid. These are the ones that capture the mystery of rabbitness and politely decline to interpret it. These photographs usually catch an expression or bodily pose and leave its meaning undecoded. These are the ones about presence, nce, that is, the miracle of rabbit existence rather than the act of human definition. In an academic article I wrote some years ago, I asked Amy if I could use one of her photographs. It shows a man and rabbit looking at each other (Smith 196). The photograph captures how disorienting rabbit vision can be to a human, how it frustrates easy interpretation. That’s what I saw in Amy’s photograph. Like her photographs reproduced here-the one of a rabbit looking out of a window (Figure 2), and another of two rabbits attending a third who explores an empty box (Figure 3)-Amy’s photograph of the man and the rabbit illustrates their different modes of awareness. It documents above all that rabbits have their own ways of knowing. which is gift enough and more. It is extraordinarily difficult to read Amy’s poem about the gift of rabbit presence and to know that we have lost the gift of hers. If any consolation is to be had, it may be that her essays and photographs remind us to value our shared existence as fellow mortals, because our time together here is so very short. Amy Shapiro, “The Gift of Their Presence.” House Rabbit Journal 2.4 (Fall 1990), 6-7. Smith, Julie Ann. “‘Viewing the Body’: Toward a Discourse of Rabbit Death.” Worldviews: Environment, Culture, Religion 9.2 (2005): 184-202. All photos by Amy Espie.